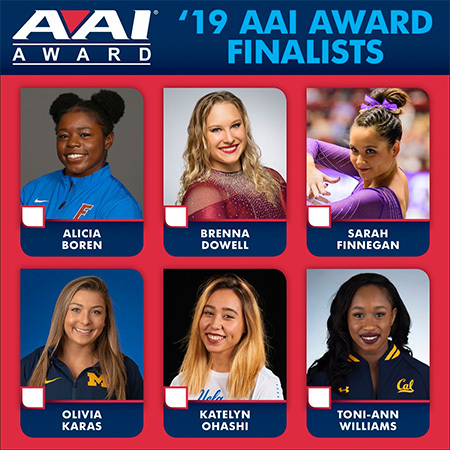 Florida's Alicia Boren, Oklhoma's Brenna Dowell, LSU's Sarah Finnegan, Michigan's Olivia Karas, UCLA's Katelyn Ohashi and Cal's Toni-Ann Williams are the six finalists for the AAI Award, which goes to the most outstanding senior gymnast in the country. It is considered the Heisman Trophy of NCAA Gymnastics. AAI announces the winner next month at the NCAA Women's Gymnastics Championships' awards banquet in Ft. Worth, Texas. Dowell has missed just one meet in her OU career and boasts a hit percentage of 98.2%, nailing 174 of her 177 routines performed thus far. As a sophomore and junior, she hit 100 percent of her routines. A three-event stud, Dowell has excelled on every event she has competed, recorded a perfect 10 on both bars and vault in her career, and posted a career high 9.975 on floor. Entering her senior year, Dowell made it her mission to compete in the all-around for the first time. She excelled immediately, earning a career-high 9.925 on beam and a career-high 39.725 in the all-around. The 2018 NCAA Vault Co-Champion has snagged four NCAA All-America honors and six NACGC/W awards in her career. She has added a runner-up finish at the NCAA Event Finals on floor exercise in 2015 and finished in the top 10 nationally twice, with a 10th place finish on bars in 2015 and a 10th place finish on floor in 2018. In addition, Dowell was the 2018 Big 12 Co-Floor Champion, the 2017 Big 12 Co-Bars Champion, the 2015 Big 12 Floor Champion and the 2015 Big 12 Newcomer of the Year. She has earned six All-Big 12 honors and has been a 10-time Big 12 weekly award winner. The Odessa, Mo. native has 39 event titles to her name. Finnegan has been paramount in LSU’s success over the last four years that includes back-to-back SEC championships and the highest finishes in school history at NCAA Championships. As a sophomore, Finnegan became the first gymnast in school history to win an uneven bars NCAA championship. In 2018, she ended the season ranked as the No. 1 bars performer in the country and anchored the Tigers’ lineup that finished first in the nation and set multiple school records. 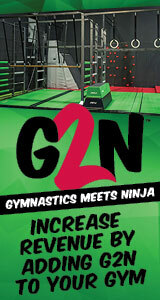 A year ago, Finnegan dominated the league with a sweep of the league all-around title and SEC Gymnast of the Year award. She pushed her career All-America honors to 15 and could break the school record for most in a career set by Rheagan Courville with 23. In 2019, Finnegan has been the most consistent gymnast in the SEC and in the nation. She has competed in the all-around in every single meet this season and won 11 of 12 all-around titles. Karas has had a terrific career at Michigan as a two-time NACGC/W All-American, the 2017 Big Ten champion on floor exercise, a two-time All-Big Ten selection, and the 2016 Big Ten Freshman of the Year. She has accumulated 39 event and all-around victories in her career. Outside of the gym, Karas is majoring in communication with a minor in writing. She is a NACGC/W Scholastic All-American, a two-time Academic All-Big Ten honoree, and a three-time U-M Academic Achievement Award recipient. Karas has hosted a team video series titled "Behind the Block M" this season and writes for the South Campus Times, a student-athlete publication at Michigan. Ohashi has raised the profile of NCAA Gymnastics to unprecedented levels, with her first perfect 10 floor exercise routine this season going viral to the tune of 117 million views. She has gone on to earn four more perfect 10s in 2019, bringing her career total to 10, fourth-most in school history. Ohashi ranks No. 1 in the nation on floor exercise with an NQS of 9.995. She is averaging 9.975 for the year and is unbeaten on floor with 10 victories. On balance beam, she ranks No. 2 in the nation with an NQS of 9.965, and she has a season average of 9.925, with a high of 9.975 achieved four times. Ohashi tied a Pac-12 single-season record this season with five Specialist of the Week awards, giving her a career total of nine, also tying the Pac-12 record. The six-time All-American is a standout off the floor as well, spearheading a fundraiser for Bruin Shelter, a student-run shelter for homeless students at UCLA, and working with Project Heal, a non-profit that provides access to healing for all people with eating disorders. She has used her celebrity platform to spread messages of self-worth, inclusiveness, empathy and finding your joy and has participated on panels around campus to talk to fellow students about body image, eating disorders and mental health. Academically, she earned Director's Honor Roll distinction last quarter and is scheduled to graduate in June with a degree in Gender Studies. In 2019, Williams collected 4 event titles with 9 top-three finishes and went 17-18 in her routines. Her lone miss came in an unfortunate floor routine as Williams saw her fifth year of eligibility come to an abrupt end, rupturing her Achilles in her final floor pass at Oregon State on Feb. 17. Prior to the injury, Williams set season-high totals of 9.90s on all three of her events – vault, beam and floor – despite dislocating her elbow in the fall. Prior to the heartbreaking end to her season in February, she amassed 77 event titles in her career. She owns the program-record scores on vault (10.0), floor (9.975) and all-around (39.700), and is one of only two gymnasts in Cal history to record a perfect 10.0. Among Williams' already-lengthy list of honors are: one NCAA All-American distinction, eight Regular-Season All-America titles, seven all-conference selections, two Regional Gymnast of the Year laurels, 2015 Pac-12 Freshman of the Year, the 2016 Pac-12 Championships floor title and a 2015 NCAA Regional vault title.